When I became interested in hybridizing, 20 years ago, I found very little information to help me get started. Judging from the questions I am frequently asked, it appears that there is still a need for basic information. Because of the challenge and satisfaction that this avocation has brought to me, I want to share my methods and thoughts with you through a series of articles. These methods are a result of experimentation, research and talking with others. They are just my way of doing things; there are many others that work equally well. I welcome your contributions, questions and comments on what works best for you. Through sharing we can all learn together. The "Hybridizing Notes" will cover the entire process of hybridizing (from cross pollinating to collecting seed and planting) and topics such as mildew, choosing parent plants, registering, and others as requested. Now is a good time to contemplate where you are going and to plan your hybridizing. Are you seeking new plants to use for hybridizing? Have you gone through the catalogs for inspiration? What do you really want to create? What is the possibility that a particular cross will produce a better or different hybrid? Is there value in this new plant I want to create? If we cross 'Purple Splendour' with 'Purple Lace' the chances are we will get a medium sized plant with a slightly different shade of purple. If we cross 'Purple Splendour' with ('Anna' x R. yakushimanum ) we will probably get a smaller plant with the potential for more exciting colors. Let's assume that I want to create a hardier yellow. I will select one parent for hardiness and another for the yellow color. 'Mrs. Furnival' is hardy to -15°F, has an excellent full truss with a blotch but has the habit of producing blind end shoots (no eyes for branching). 'Nancy Evans' is reasonably hardy (to -5°F) and is an excellent foliage plant with good branching habits. By crossing the two, can I possibly create a yellow truss with a blotch, good foliage and plant habit and hardy to -10°F? It's worth a try. Now that I selected 'Nancy Evans' and 'Mrs. Furnival' as parent plants, I need to decide which one to use as the seed parent and which one as the pollen parent. Generally the seed parent is more dominate, so if I'm seeking hardiness it seems logical to use 'Mrs. Furnival'. However, in this particular case 'Nancy Evans' must be used as the seed parent since its pollen is sterile. Some hybrids can be used as seed parents only, some as pollen parents only and some are completely sterile. Perhaps at this point we should refresh our memories on plant anatomy and terminology. The truss is the entire group of flowers on one stem. 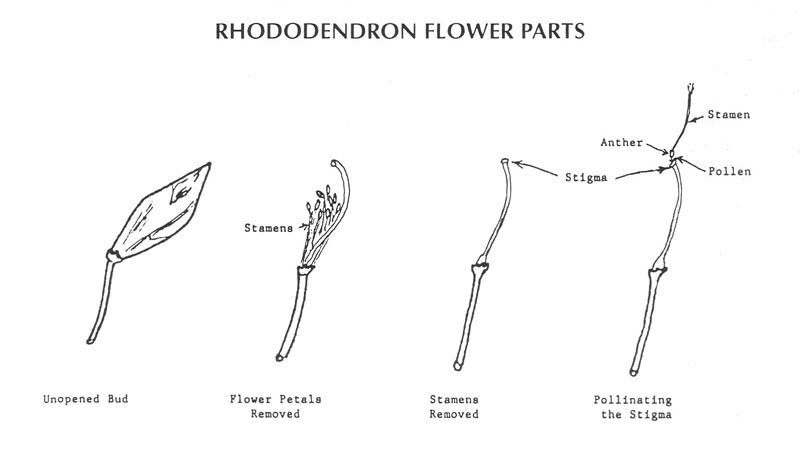 The pedicel is the part that attaches the flower to the stem. The corolla is composed of the petals of an individual flower. The pistil (one per flower) is composed of a style and stigma. The style is the long tube with a seed chamber where it attaches to the pedicel. The stigma is the very tip of the pistil. The stamens (usually 10 to 15 per flower) are composed of filaments and anthers. The anthers are the tips of the filaments that contain the pollen. Begin the hybridizing process on the seed plant by opening the flower before it opens itself. The bees are very efficient at crawling into a tiny opening and pollinating for you without discretion. Takeoff the corolla portion of the flower, leaving only the stamens and the pistil. The pistil is generally longer than the stamens but occasionally the stamens may be longer. Remove all the stamens very carefully trying not to let any pollen fall on the stigma. At this point you should have only a bare pistil. Repeat this process for as many pistils as you want to pollinate. If any of the flowers have already opened, discard them by pinching them off at the pedicel. At times you may find it difficult to open a flower without it self-pollinating. Some stamens are curved into the pistil, poised to pollinate. Some are so loaded with pollen that it drips all over the stigma at the faintest touch. There is a better chance of avoiding self-pollination by pulling off the corolla and the stamens simultaneously. If there is a chance that the stigma has been contaminated, discard it and go to another flower. If you know the plant you are working with is sterile, you do not have to be so careful. There can be pollen in the stamens, but it is of no value. Some hybridizers who are concerned that bees may land on the stigma put foil on the tip or cover the truss with cheesecloth. I do not consider this to be a problem, as I have yet to see a bee land on a stigma. The timing for pollinating is critical. Open the flower and check the stigma. It is ready to accept pollen when it is soft. If it's hard when you first open the flower, it will usually soften within a few days. Cool mornings are not easy times to pollinate, but as the day warms the stigma softens and pollen adheres much more easily. If you wait too long, the stigma hardens again and it will be too late. Some pistils will accept pollen immediately. Rhododendron yakushimanum will accept it the very same day you take the flowers off. In fact, it will self-pollinate if you aren't careful. Through experience you get to know the appearance of a stigma and understand when it is ready to accept pollen. Sometimes I wait too long and miss the whole truss. Not one seed sets. In April of 1993 when we had 28 days of rain it was difficult to make any crosses at all. During rainy weather, I use plastic sandwich baggies to keep the pistils on the cleaned flowers dry and to keep the pollen from being washed off the new crosses. I remove them when it gets warm and sunny. When the stigmas are just right on 'Nancy Evans', choose a flower from 'Mrs. Furnival' that is very close to opening and remove the stamens. Take them to the pistils that were prepared on 'Nancy Evans'. Then, holding the stamens with your thumb and forefinger, tap that hand against the side of the other hand. When you see the pollen coming out of the anthers swipe the anthers over the stigma, coating it with pollen. It may be necessary to hit your hand again to release more pollen. It's a good idea to turn your back to the plant when you are dislodging more pollen since it can fly all over and pollinate more pistils than you had intended. You may choose to pollinate all the pistils with pollen from one plant. This would provide extra seed to send to the ARS Seed Exchange. My normal practice is to pollinate at least three of the pistils with pollen from one plant, three or more different pistils with pollen from a second plant, etc. Why pollinate at least three pistils? A caterpillar may chew one off and one may rot. Generally I get at least one pod out of three if it takes at all. After making all the crosses, remove the remaining flowers. In choosing the truss to work with, do not work under another truss. You may find the truss above just self-pollinating your working truss. After making each cross, identify the pollen parent immediately with tags that have been previously prepared. This can be done in various ways from metal tags to plastic bread ties. I use a 3" x 5" index card (heavy paper) cut into twelve strips " x 5". I cut a slit in the middle about 1" from one end, like the SOLD labels you see at nurseries. I write the name of the pollen parent at the opposite end of the slit with pencil, usually on both sides. I found that water and sun deteriorated the tags and that the ink washed off. A piece of scotch tape over the name on both sides solves the problem. I thread this strip around the pedicels and slip the end through the slit. I pull it snug and thus I have isolated my pistils with the name 'Mrs. Furnival' on the tag. "My Way of Hybridizing - Part II" will address the following: Plant fertility - what if there is no pollen in the 'Mrs. Furnival' truss? How to cross a plant that blooms in May with a pollen parent that blooms in July. How to store and freeze pollen. Jim Barlup, a member of the Cascade Chapter, is the hybridizer of 'Fire Rim', which received an ARS Conditional Award in 1995 (see photo Winter 1996 issue). Five others are on the 1995 Eligibility List.